Keep in mind that this is only going to work during the Invasion leading up to the release of the newest expansion for Warcraft, Legion. Once Legion is released this guide will no longer be accurate. The big thing right now is a toy that drops off of the Dread Infiltrator,Pocket Fel Spreader It’s selling for 25K plus gold on most servers and is also only going to be available for a limited amount of time (the drop that is, once you have it, it’s yours forever). 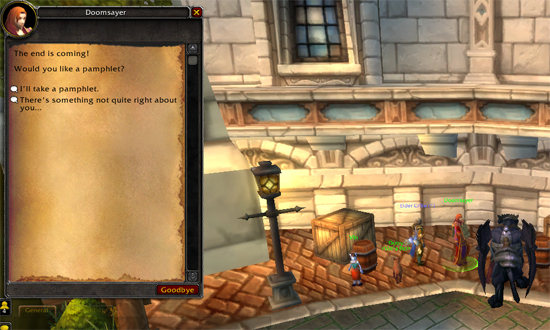 1) Locate a Doomsayer (either in Stormwind or in Orgrimmar). 2) have active something that will allow you to see demons (hunters can use demon tracking, demon hunters can use their spectral sight, other players can use Cursed Vision of Sargeras, or the elixir of detect demon. 4) Click that second option and start your fight! These Demon Infiltrators hit HARD so you want to announce in /2 exactly where you are about to spawn it ’cause you will need help! 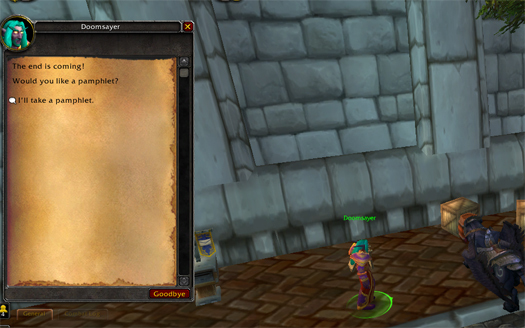 Also, from the pattern I have noticed, the Doomsayers will have that second option appear about 15 minutes AFTER YOU have spawned it previously. I am still looking to see if it’s a personal cool-down or if it is a global cool-down. I’ll update this article as I discover that. I will note too that the cool-downs are hidden.